•	Load ranges from 50kg up to 12000kg per wheel. White nylon wheel with a plain bearing. Wheel diameter 50mm, tread width 17mm, bore size 8mm, hub width 20mm, load capacity 60kgs. 50mm diameter white nylon wheel with a plain bearing. Tread width 24mm, bore 8mm, hub 28mm. Load capacity 50kg. 63mm diameter white nylon wheel with a plain bearing. Tread width 23mm, bore 9.5mm, hub 33mm. Load capacity 120kg. White nylon wheel with a plain bearing. Wheel diameter 50mm, tread width 20mm, bore size 8mm, hub width 24mm, load capacity 80kgs. White nylon wheel with a 12mm x 39mm plain bearing. Wheel diameter 75mm, tread width 25mm, hub width 39mm. Load capacity 150kg. Black nylon wheel with a 12mm x 39mm plain bearing. Wheel diameter 75mm, tread width 25mm, hub widht 39mm. Load capacity 150kg. White nylon wheel with plain bearing. wheel diameter 80mm, tread width 30mm, bore size 12mm, hub length 39mm. Load capacity 150kg. White nylon wheel with a plain bearing. Wheel diameter 40mm, tread width 38mm, hub length 39mm bore size 15mm, . Load capacity 200kg. White nylon wheel with a plain bearing. Wheel diameter 100mm, tread width 32mm, bore size 15mm, hub length 48mm. Load capacity 270kg. 75mm nylon wheel, with plain bore, 28mm tread width, 12mm bore, 40mm hub width, with a load capacity of 150kgs. White nylon wheel with a plain bearing. Wheel diameter 50mm, tread width 28mm, hub width 30mm bore size 15mm, Load capacity 200kg. White nylon wheel with a plain bearing. Wheel diameter 100mm, tread width 30mm, bore size 12mm, hub length 40mm. Load capacity 180kg. White nylon wheel with a plain bearing. Wheel diameter 100mm, tread width 32mm, bore size 20mm, hub length 40mm. Load capacity 180kg. White nylon wheel with plain bearing. Diameter 60mm, tread width 35mm, bore size 12mm, hub length 40mm. Load capacity 150kg. White nylon wheel with a 12mm plain bore. Wheel diameter 100mm, tread width 32mm. Hub 44mm, Load capacity 270kg. White nylon wheel with a plain bearing. Wheel diameter 100mm, tread width 32mm, bore size 20mm, hub length 45mm. Load capacity 270kg. White nylon wheel with plain bearing. wheel diameter 80mm, tread width 35mm, bore size 12mm, hub length 45mm. Load capacity 250kg. 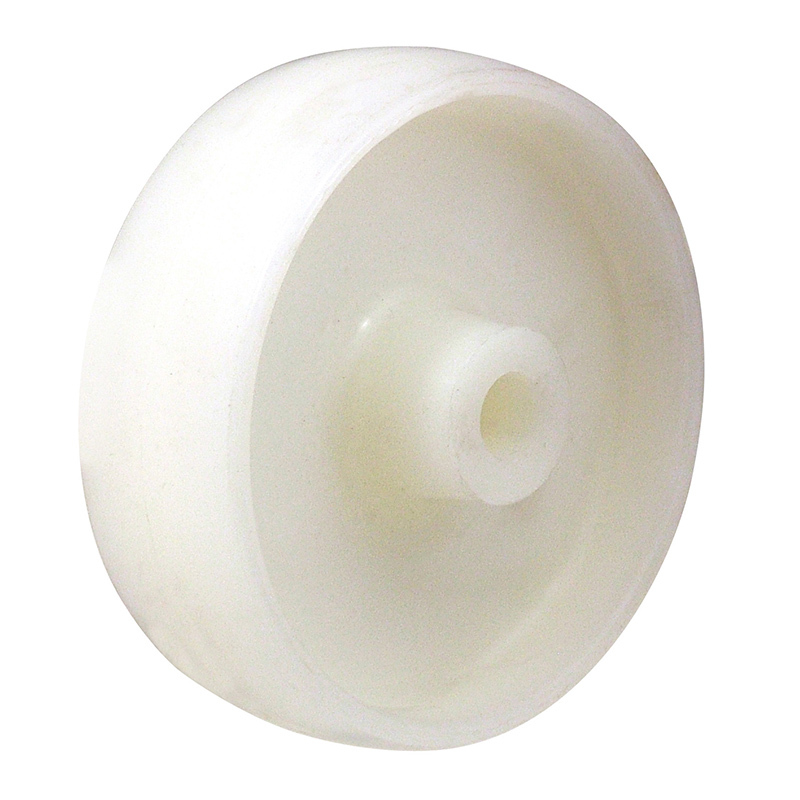 White nylon wheel with a 15mm x 48mm plain bearing. Wheel diameter 125mm, tread width 35mm. Hub 48mm. Load capacity 300kg. White nylon wheel with a roller bearing. Wheel diameter 100mm, tread width 32mm, bore size 15mm, hub length 48mm. Load capacity 270kg. White nylon wheel with a 12mm roller bearing. Wheel diameter 100mm, tread width 32mm. Hub 44mm, Load capacity 270kg. White nylon wheel with a plain bearing. Wheel diameter 65mm, tread width 37mm, hub width 40mm bore size 15mm, Load capacity 300kg. White nylon wheel with roller bearing. wheel diameter 80mm, tread width 35mm, bore size 12mm, hub length 45mm. Load capacity 250kg.